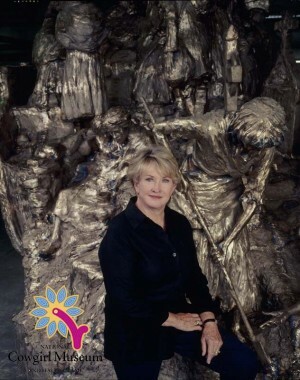 A lifelong passion for portraying the human figure is reflected in the work of accomplished sculptor Glenna Goodacre. Her most well-known works include the Vietnam Women’s Memorial installed in Washington, D.C. in 1993, the Irish Memorial installed in downtown Philadelphia in 2003, and her rendering of Sacagawea that appeared on a new dollar coin issued by the U. S. Mint in 2000. Goodacre’s astonishing abilities have earned her a long list of honors including honorary doctorates from Colorado College (her alma mater), and Texas Tech University. In 2003, she was awarded the prestigious Texas Medal of Arts.